This generation is obsessed with “story-ing.” Anyone ages 14 to 25 constantly update their stories. These are instant posts. They show what you are doing at that exact moment. If you do a regular post on Facebook or Instagram like uploading a photo, others can’t be sure that it is from that day, that moment when you post it. However, Instagram, Snapchat and Facebook stories are all taken at the time shown or within 24 hours of a follower watching it. Not only, but also Millennial’s and Generation Z & Y often have “FOMO,” or fear of missing out. The “story” concept keeps them up to date. It leaves your followers constantly in the know of what is going on with their friends and followers at that time. If your company is new to digital analytics, measuring your results can seem like a rabbit hole. It’s easy to become overwhelmed with so much information you COULD use to track your digital ROI. Thankfully, you can avoid the dizzying world of analytics—by learning what matters to you. Try not to distract yourself with the endless data available. When measuring your results, start with what is directly relevant to your business. If you need a place to start, use these two observations for guidance. High performing content/webpages. When you know what your audience wants, you can better focus your marketing efforts. Take an audit of your highest performing content during a given period. The information can help drive a content plan you can monitor and test. Social media growth. This is broad information, but a trend in followers or engagement could signify an opportunity or gap in communication. Measuring your social media growth is an opportunity to look at your audience from a birds-eye view. A goal to grow your social followers could inspire a focused campaign you can track and adjust. The easiest approach is to start small until you know your intentions. Consider Buildfire’s 18 essential metrics to measure your digital marketing. You will not need all these measurements, but it’s a great checklist for finding the measurements that matter. Measurement is as simple or as complicated as you need it to be. If you are team of 20, you might have the flexibility to take a deeper dive into your analytics. A smaller team might have to be a little more creative. Knowing your capacity can help weed out what is most important. Perform your planned measurements for a set period, such as six months. Review the results with your team and determine if the data is useful. Do you have enough information? Are your measurements too specific? Are you missing information that could help you make an informed decision? You should reassess your measurement strategy on a regular basis. When using analytics, you should know what you are measuring and why. Start small and build a plan that gives you results you can understand and apply. Say hello to vertical TV. Instagram launched IGTV in 2018, competing with YouTube for video content. I will share with you a few tips on how to use IGTV for you brand to drive engagement. Where Youtube brings you horizontal video content, IGTV is all about being vertical. It’s quite normal to hold your phone vertically when texting, answering emails, and surfing the web. With IGTV, you don’t have to change the orientation of the phone in hand. You can now view full screen videos vertically. Most mobile devices record HD quality video. To take it up a notch. Invest in lenses for your mobile device. There are a variety of lenses such as wide angle and zoom. Here are a few to consider. Also, purchase a lapel mic. You wouldn’t want your followers hearing crappy audio. Lastly, buy a stabilizer or place your phone on a tripod. Watching shakey content isn’t that pleasant. Lighting is a must. You can find a nice window with lots of natural light shining in or you can purchase a ring light. Give weekly tips on how to apply makeup. Talk about real estate every Wednesday. Teach people how to make their resumes are ATS compliant. These are examples of what kind of content you can create. Be sure to be consistent.. Showing the day in the life content allows your followers into your world. It gives them a back seat ride of your vision. You also can use this platform to be interviewed or interview people involved with your project. Understanding how important quality is will help solidify your brand with your audience. Purchasing the necessary equipment. IGTV is a platform where you can create 10 minutes to 60 minutes worth of vertical content that will drive engagement with your audience. Are you pitching bloggers and influencers the right way? Content creators work under pressure to keep their followers entertained. For a lot of them, this is a side job, between their other job responsibilities. Even stay at home mommy bloggers have a busy life, but they set aside some time for blogging. Public relations professionals should consider this when emailing them to ask them to do stuff, most of the time offering “great exposure” in exchange. A lot of PR people fail when trying to reach bloggers and influencers, because of their lack of time or experience to do it. So… You want to start a Podcast in 2019, but don’t know where to begin? Let’s break it down into 6 easy steps so you can successfully Start a Podcast in 2019. Did you know that 64% of the US population is familiar with what Podcasts are? That is around 208 million people! And according to musicoomph.com, of those 208 million who are familiar with Podcasts, 44% have listened to a Podcast. That is a potential audience of 143 million people in the US alone! Now that we have some statistics behind us, let’s get to the good stuff. Pick a topic you want to talk about! Have a passion for something in particular? You’ll find that it is easier to talk on a subject you are passionate about. Plan your episodes. As with most things, planning is key. How long will your episodes be? What is the topic you plan to talk about in each episode? How often will you publish your Podcasts? When you start your podcast, it is important to stick to one topic per episode. Your audience will appreciate the time you put into planning. When you start a podcast it is very important to test your equipment! Is everything working properly? Make sure that you have a quality microphone and have a quiet space with no interruptions to record your Podcast episodes. So, tell me below how you plan to start your podcast in 2019! Hashtags tell stories and build brand associations. They connect social media users to other people, places and brands. To be effective, small businesses must first do their research then integrate them into content plans. This is important because hashtags increase visibility and provide relevancy. On Twitter, hashtags associate tweets with relevant topics and events. Feeds update by the second, so as a result content quickly resonates with audiences. Consequently, small businesses can insert themselves into trending topics and gain relevancy. People search hashtags to find desired content. Facebook, Instagram, Pinterest and LinkedIn allow users to both search and follow them. As a result, small businesses can gain better visibility with target audiences. Simplicity is key to an effective social media content plan. However, generic content misses the target audience. Small businesses must know who they want to speak to and what they want to say. Effective content plans incorporate both relevant and unique content. Do the research. Search hashtags across all applicable social media platforms. Identify who uses them and the type of content they share then adapt the content plan. Focus on relevancy. Use keywords the target audience searches and uses. Search and follow these hashtags to guide content creation. Be unique. Logos and slogans are essential to a brand. Similarly, unique hashtags digitally establish a brand. Keep it simple and use them consistently across platforms. There are many helpful tools that provide hashtag analysis across platforms. Use these tools in conjunction with manual searches on social media platforms. Use the quantitative and qualitative analysis to build an integrated marketing and branding strategy. Most importantly, keep focus on the target audience. Use hashtags to first connect audiences to the content, then immerse them in relevant content. There are lot of blogs about how to use Instagram more effectively, how to become an influencers, and tips on using the tools. This isn’t that blog. I will share with you what not to do on Instagram. Quality is everything. First, it’s visually pleasing. Secondly, it adds to your credibility. Perception is everything. iPhones and Androids both take decent photos, but the quality of a professional photos exceeds expectations. If you’re taking photos with a mobile device, make sure you have great lighting. As as result, you will avoid grainy photos. We share our lives with millions of people we don’t know on Instagram. Posting photos of vacations, family gatherings, and so much more. It’s the social world we live in today. When posting, please be careful sharing whole names and home addresses. You must keep in mind most of your followers are strangers. Protect your identity as well as your family and friends. You have the option to add locations to your photo or story you share. You don’t have to add location in real time. For instance, you go to a coffee shop and take a photo of your coffee. You can post later and tag the location of the coffee shop when you get to your next destination. In the real world, you shouldn’t buy friends. Well, the same applies to followers on Instagram. The union should be organic. Create authentic content, be consistent, and they will come. It might be tedious, but with the right focus and determination, they will come. Buying Instagram followers won’t help you long term. A picture might say a thousand words, but adding captions tell more. The photo you post can grab your followers attention. To add captions, can hold them there and maybe even inspire them. You have a better chance to drive engagement when adding caption to your post. Be smart when sharing post. The same common sense apply in the real world should apply on social media. Think three times then post. Like on Twitter and other platforms, Instagram hashtags work by organizing photo and video content. Hashtags are a great way to gain more engagement on your Instagram posts. Consequently, according to simplymeasured.com, posts with at least one hashtag averages 13% more engagement than posts without a hashtag. Instagram has gone through a number of changes by adding new tools, features, and a new video channel. Even with the changes, one thing remains the same: Instagram hashtags are as important as ever. Here are a few tips and tricks to keep in mind when using Instagram hashtags. Instagram business profiles allow users to track the success of the hashtags used. Instagram Insights provides the ability to analyze how effective the hashtags are in getting more impressions on each post. Instagram added the ability to follow hashtags in 2018. Users can now follow a specific hashtag related to a desired topic. Following a hashtag works like following a user’s profile. Simply follow a hashtag by going to the hashtag page and tapping the follow button. Instagram recently added the ability to add hashtags to Instagram stories. This allows users another strategic way to have their content discovered. Therefore, hashtags can be added to stories by typing out the hashtag with the text tool or by using the hashtag sticker. Another recent update allows users to add clickable hashtags to an Instagram bio. As a result of this update your bio is now more functional. You can use hashtags to promote your community and highlight branded content and campaigns. The use of relevant hashtags on your posts and stories is one of the best ways to get discovered by new audiences. As a result, this can translate into more engagement, more followers, and more customers for your business. If you’re a writer, you know the importance of good content that connects with your audience. To connect effectively, you should seek to listen as well as to inform. Here are four helpful tips for finding topics relevant to your audience. Never underestimate the power of a conversation scan. In digital, conversation scans are a simple way to check for any gaps in your messaging. Is there confusion about your ticket purchase system? Are your customers unaware of a helpful document on your website? Use these scans to adjust and add to your messaging as needed. Customers notice when you take the initiative to improve service. Look for transparency opportunities. Your Instagram followers might enjoy photos of your unfrosted cupcakes fresh out of the oven. Your newsletter subscribers might appreciate a quarterly bio on your gallery’s local artists. The more genuine you appears, the more connected and accessible you appear to your audience. Lifestyle messages can help you tap into what is important to your audience. Your audience’s interests vary, so highlighting shared lifestyle elements could generate new conversation around your business. If you need help getting started, check out this blog from Social Media Today: How to Successfully Integrate Lifestyle Content into Your Social Media Strategy. To connect with your audience, you must know your audience. By investing the time to learn more about your audience, you strengthen your credibility and digital presence. When in doubt, talk. Talking is the simplest way to connect with your audience. In fact, when planning content, talking to your audience should occur regularly. Ask your audience questions and be prepared to respond to comments. Your audience should feel their experience with your business is what matters to you. Create Effective Local Advertising By Keeping It Simple. You see it every day. Loud, messy, and incoherent advertising that’s screaming for your attention. But rather than promote your company and its reputation, these ads will become a turn-off to the consumer. Create more effective advertising by keeping the production of your ads simple. When producing your companies advertising, get to know your agency, and it’s capabilities. Most agencies that work with local businesses do not have access to high-end production talent. So if you ask them to produce something inspired by the latest Marvel movie, you will be sorely let down. And worst, it will be so bad, that it will do more harm than good. Make sure you have a clear message and a powerful incentive. Remember, you do not have a Hollywood budget. So keep the graphics clean and readable. Create effective advertising by keeping colors and graphics well defined. Do not throw every new effect, transition or graphic into your ad. Find a color scheme and stick to it. Defining the ads style will help keep the message clear. But bombarding the ‘sad with too many different colors, fonts, animations will create a chaotic commercial that will be hard for people to follow. Always work within your level of expertise. Do not use your advertising as a means for experimentation on new production techniques. Use methods you have already established and are confident in performing. Never let your lack of experience, get in the way of the message. The message and how it delivered effectively is the most important thing in producing your ad. Finally, understand that it is nearly impossible to wow your customer with locally produced advertising. So rely on a message that’s honest and always puts the customer first. Keep the message local and relevant. Work within your comfort zone. Remember, clean and simple works well, when the message or offer is compelling. Executives on Social Media: Should Your Leaders Post Online? Queen Elizabeth II recently made headlines for sharing a photo on Instagram for the first time (via the Royal Family’s official account). Though we likely won’t see frequent posts from the Queen, quite a few leaders have embraced digital platforms as a way to connect with their fans or customers. As you examine your brand’s communication strategies, evaluate if having your executives on social media makes sense. The idea of your top leaders tweeting may seem a bit daunting. And, you’re not alone. According to a 2016 report, more than half of Fortune 500 CEOs don’t have a social media presence. It may be best for your leaders to stay offline, but ensure you’ve considered the pros and cons first. How can Pinterest help you grow your business? You may be confusing your potential clients with how your website talks about calculating advertising ROI (Return on Investment). Worse, you may be losing credibility and prospects who know better, thinking you are intentionally misleading them. Is your calculation about Profitability or is it about Growing Revenue? Advertising ROI is a tool to help your client understand the bottom-line contribution of advertising. Yet, if you quickly scan the articles from a Google search, you may well find a confusing mess. You will often find marketers and agencies talk of ROI in terms of Revenue. “A good marketing ROI is 5:1”. – 🙋 Really? Not to pick on this guy – He’s just mixing up the terminology. There are others that may reach the first page of search results, and some are much more misleading. Wrong! Here are some that are right. Advertising ROI is about PROFIT – the money your client will have pocketed from their investment in your advertising campaign. If your client were to achieve that 5:1 ratio suggested above, how would you advise your client? Should they invest more in advertising based on those numbers? Invest less? Without profit in the picture, you and your clients have no basis to make a reliable investment decision or judge the fundamental success or failure of their investment. The difference between calculating Advertising ROI and ROAS is Profit vs Revenue. Remember the 5:1 rule of thumb? Yep, he was saying ROI, but talking about ROAS. Where does Revenue go again? You can use this simple ratio to help you determine which channels, or advertising tactics for a campaign are most effective – with optimizing for growth. But, alone, it cannot help you decide if advertising is worth the investment. Are you pointing to the correct thing? Your client will love that you are feeding their bottom-line. For that you need to calculate your Advertising ROI. But, you also need to know which ads and which channels are performing well for your client’s money. For that you need to know your ROAS by each. You could argue that with both these calculations there are issues of timing and complexity with attribution, especially with larger clients. True, but working around those complications and considerations are the subject for another article, and not a reason to obscure what these two measurements are and how they are used. And, be mindful of the differences when you see a website or someone presents to you a calculation of Advertising ROI based on Revenue. Are they confused, or are they misleading? You decide, now that you know. Whether you are a reporter, journalist, social media expert, or blogger, content is vital. From phone conversation to trends on social media, you want your audience to receive the best content catered to their interests. As a digital guru, you are always on the go trying to find the right content and pinpointing contacts. Don’t miss important information because you don’t have access to the right tools. Here are the best 5 apps for the mobile digital media professional. Should HOA’s use the Nextdoor App? Visuals in social media are a great way for companies to market their content. At times, a pic really is worth a thousand words. For home builders, visual content is a very specific art. In this blog, we look at the reasons Facebook, Instagram, Twitter, and Houzz are the best choices for visual content. This is where we learn not to be boring. To learn more, click the link below. Visuals in Social Media Work! Facebook has older users. This is an important audience for builders. Facebook users like to tell stories. The auto play of videos in the user’s feed creates more engagement and leads to sharing. Facebook is also one of the best platforms for families and groups. Easy visuals work well here. Instagram has younger users. Here, visuals help home builders show the great work they do. Interior and exterior pics of the home are inspiring. Progress pics make for great daily content. Instagram is now ranking stories that have visuals higher for trending. Houzz is about an online community of users. Described as a new way to design a home, the site connects local interest. Houzz helps users engage with projects to get fresh ideas. Future concepts and ideas engage users looking at projects down the road. Twitter posts are short and tweet. Well, short and to the point. Quick bits of info, news, and snapshots trend best. A simple exterior pic can inspire users. It’s not as much about the story, it’s about the image. Image rules. Thanks for stopping by, hope you enjoyed this blog series. Although focused on home building, all companies benefit from strong digital and social media strategies. Using images in those strategies is the right way to engage your audience. We’ll see you next time! 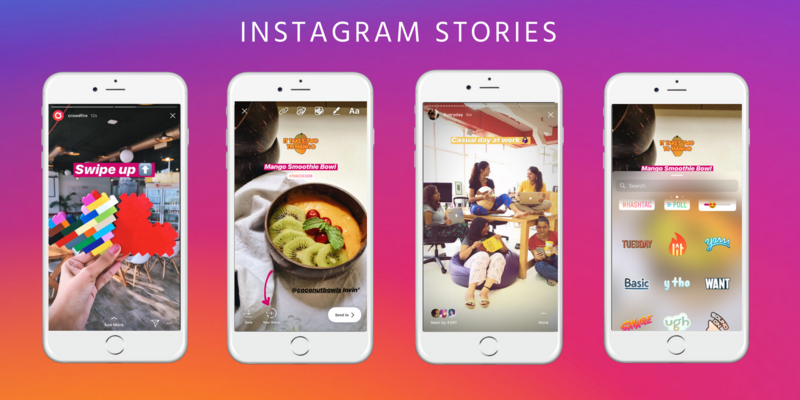 It’s no secret that since Instagram Stories launched in 2016, they’ve become one of the most popular ways to engage with your audience. Here are some easy ways to use Instagram Stories to Build your Following. Did you know that Instagram now has more than 1 billion monthly active users? And according to business.instagram.com, 200 Million+ Users visit at least one business account every day! In addition, there are more than 400 million Instagram Stories every day – and 1/3rd of these stories are from business accounts. After all, your customers are some of your best advocates. Share how your customers are using your products in their everyday life. Making your product relatable and usable is one of the best ways to build your following. Keep in mind that Stories should be an *extension of your feed. * After all, Instagram Stories only last for 24 hours! Instagram is a visual platform. Make sure your images are high quality and do not add loads of text onto your story. If you’re using Boomerang, plan it out in advance. A rushed boomerang will appear frenzied and your audience may miss the message. Last, but not least, have some fun with your Instagram Stories! In the words of Marie Kondo, spark joy! Have your friends and family complained about you being on Instagram too much? They always mention how often you post. Would you like to justify your usage? Become an Instagram Influencer! I will share with you some tips on becoming an Instagram Influencer. What is your passion? Is it styling? Is it fashion? Do you have a particular brand you adore? Make sure whatever you choose is something you’re passionate about. A lot of time will be spent promoting this brand on Instagram. We’re talking several post per day. It might appear as work, but make sure you enjoy it. You just discovered a cool coffee shop in your area and want to visit. Don’t forget to bring your camera or a friend with a camera! Documenting your experience is a must because you want be able to provide influence to your audience. Photos and video will work wonders in this case of storytelling. Please remember quality photos and video so that it helps your credibility. Also, use all of the Instagram tools that are given to tell the story. Use Instagram story, IGTV, and highlights to further your message. Choose a style and stick to it. Your platform should have harmonic style and consistency for your audience. Here are some examples of some influencer who capitalize on consistent style. Tag and communicate with relevant brands. If you’re a photographer and want to grow as brand content curator, create content and tag that brand. Overtime, you will position yourself as a thought leader. Also, create a specific hashtag for the campaign in order to direct followers to the campaign. In conclusion to becoming an Instagram Influencer, use these tips as a guide. Research your favorite brands, study other influencers, but don’t copy their style. Find your niche, create your style, and be unique. As of January 2019 there were 326 million monthly active Twitter users with 500 million tweets being sent each day. 46% of twitter users are on the platform daily. Twitter is great for getting news out quickly, providing short updates or sharing links to larger articles. Many businesses use Twitter to share images and videos. This is a great platform for interacting with users by mentioning, liking and retweeting other users’ tweets. Many companies do well with Twitter by using their brand voice and personality on the platform. Many consumers would rather direct a complaint to a business via Twitter instead of picking up the phone or writing an email. As a result, many organizations use Twitter as a way to handle customer service. Twitter is growing rapidly. The size of the Twitter audience is growing every day. It provides a huge opportunity for businesses to look for potential customers. It allows the opportunity to find new customers but also connect with the current customers and interact with them. Like any other Social Network, Twitter provides two way communication. So with everything that you post on Twitter, your audience is bound to have a reaction to it and they will let you know about it in the replies. For any business, large or small, it becomes important for you to build brand awareness. Twitter allows you to connect with new users with its promotional ads. You can select demographic and run ads to reach out to the new audience. Twitter is also a great platform to use your brand voice and personality. Many brands such as Charmin, JetBlue, KFC, and Wendy’s have proven that you can have a fun personality and a humorous brand voice on Twitter. Twitter has successfully been used for customer service. Businesses can monitor what people are saying about them in real time and issues can be resolved quickly so that the situation does not get out of control. Moreover, you can also interact with your customers to discover what they expect or think about your product that would help you to develop a better marketing strategy and provide inputs to improve your products or services. Because everything on Twitter happens in real time, having your presence there is a great asset in terms of handling customer support. Unlike other platforms where you have to open different chat windows to talk to different customers, in Twitter, you have a steady feed dedicated to just your customer’s queries. This allows your customer support team to be very efficient in prioritizing which queries to reply to first and develop context before you actually reply to them. This allows businesses to considerably cut down the response time and allows them to resolve concerns quickly. Twitter is one of the best platforms for businesses looking to grow customer connections, increase brand awareness, and improve customer support. Consequently, every business should be actively using Twitter. What is the scent memory of your favorite summer vacation from your childhood? Smell is one of our most primal senses. It has the power to transport us in time with just a whiff. Triggers memories both good and bad almost instantly. Scent marketing is a sophisticated stimulatory marketing technique aimed at taking advantage of the sense of smell which is closest to the emotional quarter of the brain. It enables brands to be associated with a unique scent that can build consumer affinity through its sensory DNA. Brands strive to have an emotional connection with consumers. Scent marketing is a powerful tool for this. Let us explore 3 main scopes of scent marketing. Why do you like the laundry detergent you buy? Is it just the efficacy it delivers or is it the way it makes your clothes smell and feel? Fragrance plays a vital role in home care and personal care products. It reflects the ingredient claims, the benefit it delivers and the emotion it wants to evoke. Fragrances become iconic to the brand. For example, Johnson & Johnson baby powder. Be it an invigorating shower, or the smell of crisp sun-dried linen. The smell of the product has a huge impact on repurchase behavior. Hence brands work hard to develop a fragrance that is unique to its brand offering. The basis for scent marketing is to ensure that every brand has a unique scent structure at its core. These are building blocks for the further variant extension it might come up with in the future. What does the aroma of warm popcorn remind you of? Ambient aromatization is a key scope for Scent marketing. Brands can develop a signature fragrance that captures its values and the emotion it wants to trigger. This enhances overall consumer interaction and memorability. Banks should evoke a sense of security. Hospitals should impart a feeling of safety and care. Retail outlets, Banks, Hotels, Hospitals, Theaters take advantage of this. Apart from looking the same scent marketing makes them smell the same too. Therefore, the scent subliminally imprints a memory in the consumer’s mind every time they check in. These scents can be customized to the core values of industry and the brand in turn. So, the next time you check into a hotel, take a deep breath and feel scent marketing in the air. Brands with strong olfaction can play it up to their strength. They can use it to remind the consumers about them. The scent is their advertisement. Imagine the smell of warm sugary vanilla and cinnamon drizzled on freshly baked buns. What does it remind you of? Brands such as Cinnabon are known amplifying their scent. As part of scent marketing initiative, they engineer the stores to emit their delectable aroma. Corporates are recognizing the cognitive power of scents and scent marketing. Therefore, they are developing their corporate olfactive DNA to enhance productivity. It also boosts employee performance at a subconscious level. So, the air freshener in the office is not just to make the office smell great, but it is also chosen to make the employee perform better and feel good. Scent marketing is the most powerful form of sensory marketing. However, it has challenges in today’s changing marketing context. Consumers are moving towards online experience and e-commerce. The challenge is to communicate scent experience online? Researches in the digital scent technology segment may have the answer. It enables sensing and sharing scent experience digitally. For example, Scentee an app based add on for mobile phones. It allows you to choose scents for your notification. Imagine your morning alarm with the aroma of fresh coffee. Thus with such technologies in the future, there could be a day when brands can trigger scents via social media. Thus elevating social media engagement to the next level. Keeping track of analytics is the best way to know if your social media strategy is working. Above all, you need to figure out what your business needs from social media. For some businesses, sales are important; others need to increase brand awareness. One of the best way to bring success to your company, is choosing the right social media analytics tool, depending on your business goals. Having a lot of followers and likes is great, however, tracking audience reach and engagement is even more important. If you’ve been driving around Dallas this past week, you may have noticed signs for “Pancake Supper”, “Pancake Tuesday”, or “Shrove Tuesday” at some local churches. What this means is you can get hot pancakes, butter, and syrup for about $5 all around town! What’s this all about? Well, here are 3 things to know about Shrove Tuesday. Social media’s primary purpose is to connect and share. Growing an audience on any platform requires planning and patience. Small businesses can take two approaches to grow their audience. Organic is grassroots and free, but time consuming. Paid expands reach but requires financial investment. Evaluate the following to determine the best approach. Facebook, Instagram and Pinterest rely on algorithms to curate user timelines. Because of the lower initial visibility of posts, small businesses have to dedicate more time to these platforms. Twitter has the greatest potential for immediate visibility. However, users are now able to sort their timelines to view tweets with high engagement. Organic social media has a higher dependency on frequency and consistency. Organic social media may not always be feasible for businesses with smaller teams. Paid social media increases visibility and reach with less time investment. Parameters can be set based on chosen demographics and desired audience. Costs vary depending on the need and platform, but solutions are scalable. Evaluate both organic and paid social media as part of an integrated marketing plan. Mix both approaches for robust, but sustainable social media plans. Prioritize platforms then allocate resources accordingly. Content schedulers and analytics tools also help with planning and prioritization. Time and budget management are vital to success with both approaches. Building social media success starts from the ground up. In my last blog we looked at key social hacks. This week, we look at a Hubspot article that breaks down how builders use key hacks. We review the top four and how they work. Click on the link below to learn more. Lennar uses Facebook to build social success. Facebook is about sharing a story with images or video. Lennar believes story telling connects people and milestones. They use owner testimonies to build engagement. This engagement is what Facebook users value. It leads to conversation and sharing. David Weekley uses Instagram to build social success. Instagram uses pictures and video over story to engage their audience. Pretty pictures create interest. Instagram users see this as inspirational, leading to more sharing. Sharing expands reach and connections. Fischer Homes meets people on Houzz. Houzz lets them reach current homeowners. It also lets them see the information users are engaged with. This includes studios and other builders. By sharing on project boards they bring like people together. Habitat finds people on Twitter. Posts using hashtags link back to their blog. Their blog then links back to the website. The website tells the orign story. An important note, Twitter posts using images receive more engagement. Social media success starts with a good origin story. Then creative and unique content. Once in place, the right social media helps to stand out. This all helps reach the right audience and achieve key goals. Thank you for stopping by. If you enjoyed my blog please follow along. We’ll see you next time.